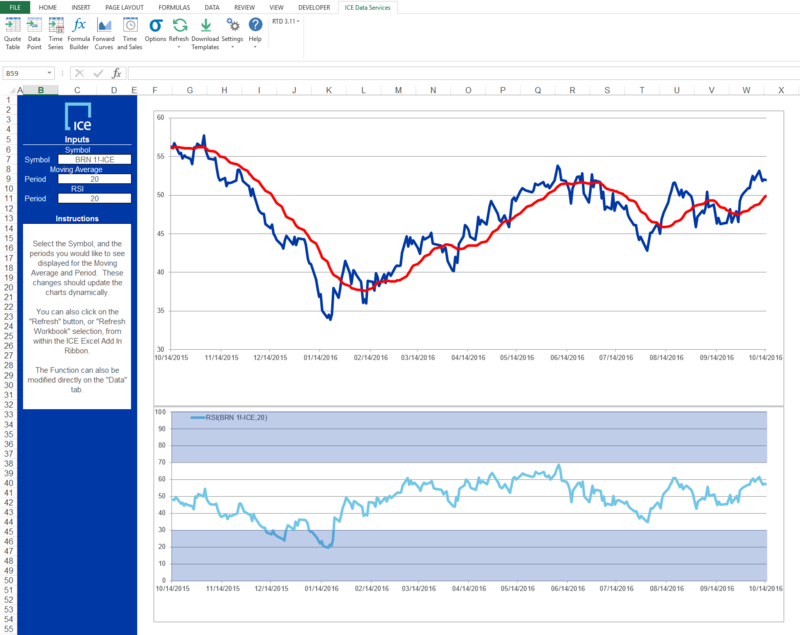 ICE Excel Add-In templates give you the tools needed to build simple to complex real-time market analysis spreadsheets. The historical data feature provides access to ICE Data Services’ deep historical databases. 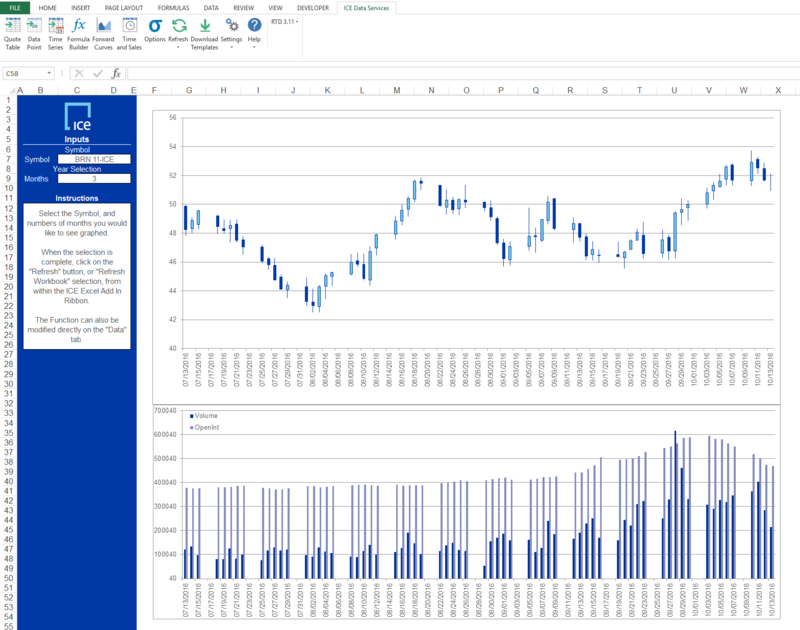 ICE Excel Add-In integrates seamlessly into your existing Microsoft Excel environment, providing fast access to real-time and historical market data. It takes advantage of the flexibility of Excel to provide users with an environment to perform complex market data analysis. Learn about the most common features offered in ICE XL, with how-to guides and examples for each of the following tools; Quote Table, Data Points, Time Series, Time and Sales and Options. Use this prebuilt FX interpolator to provide FX forward rates at specified dates in the future. Macro enabled workbook. The Datapoint template showcases some of the flexibility within the application. From monthly averages to unit and currency conversion, the Add In can output nearly any request into a single cell. Dynamically change technical indicators in the formula chart in Excel. Formulas can be used for simple cracks and spreads, as well as advanced statistical functions. 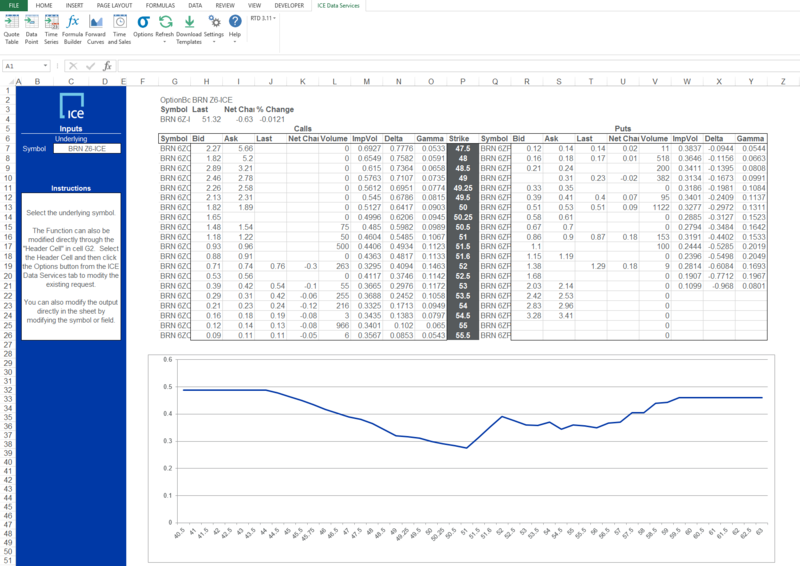 Retrieve deep Daily, or intraday history directly into excel. 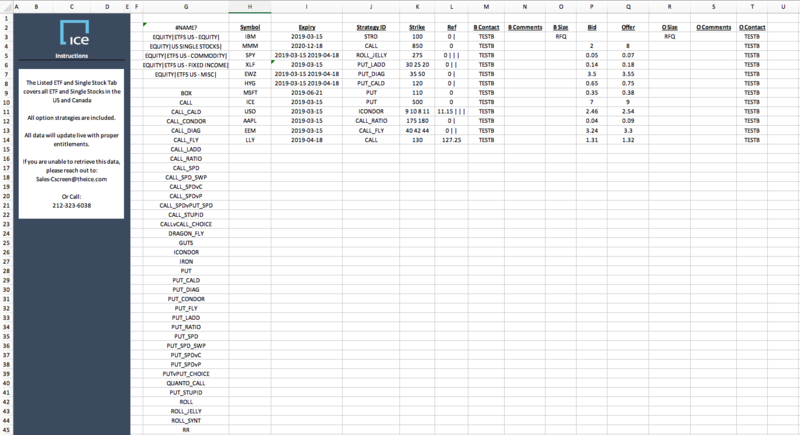 Advanced parameters for removing weekends, holidays, and advanced fill mechanics to manage disparate datasets. Output a flexible array of live data. 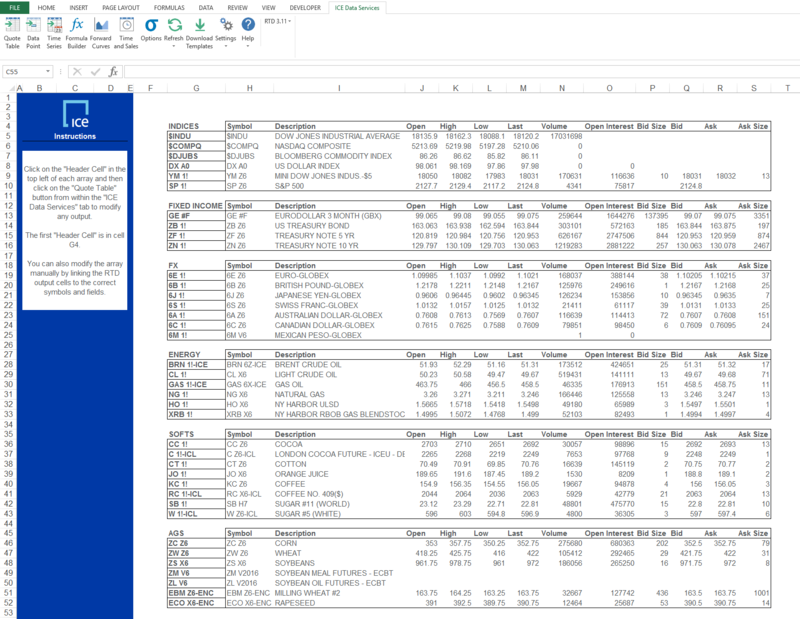 The Quote table is easy to generate or modify, either directly in Excel or through our advanced Add In windows. Plot the forward curve of any future on a selection of days. The Forward curve tool is flexible for both outright futures as well as expressions and spreads. View the historical data year-over-year in this seasonality output. 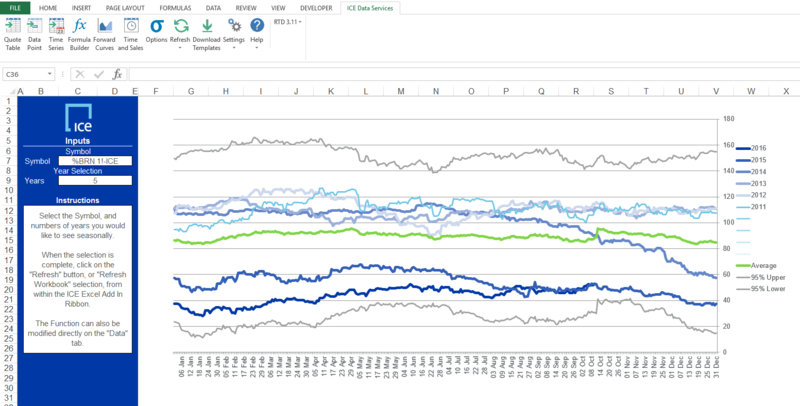 Our seasonality functionality allows for rolling years, distinct ranges in time, and even intraday seasonality which outputs day-over-day. The Options window generates a dynamic options board directly in Excel. The strike prices and expirations update dynamically and allow the user to create robust analytical sheets with definable Black-Scholes parameters. Continuous Fixed Income Evaluated Pricing extends our industry leading end-of-day evaluations to intraday by using market information to create a continuous evaluated price. Our innovative approach combines both quantitative and qualitative assessments, overseen by our global evaluation team, to generate an independent, continuous stream of fixed income evaluations that can be used to support trading, transaction cost analysis, and best execution. Cscreen is the leading global pre-trade price discovery platform used by 80+ brokers and 130+ banks and trading houses to post and respond to ‘Indications of Interest’ (IOIs) in respect of listed and OTC equity derivatives. This template was created to help traders source customized data from Cscreen for the U.S. Equity Derivatives markets. Note: Excel templates for 3.x versions of FutureSource available here.